VW says it is working out how to refit the software in the 11m diesel engines involved in the emission's scandal. VW said it would inform customers "in the next few weeks and months" about how refits would take place. 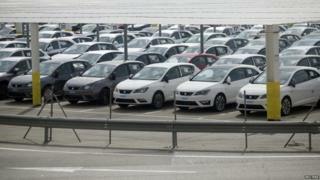 Seat also said it planned to contact owners so their cars can undergo tests. Car emissions tests - fit for purpose? The scandal is continuing to hit VW's share price. On Tuesday it fell another 1.5% during morning trade in Frankfurt. The company has lost 35% of its market value since last Monday. The effects are also spilling over into the local economy around VW's headquarters in Wolfsburg. The city is expecting a fall in business tax revenue from VW and the mayor has announced a budget freeze and hiring ban on public sector workers. The scandal was revealed after the US Environmental Protection Agency found that some VW diesel cars were fitted with devices that could detect when the engine was being tested, and could change the car's performance to improve results. The German company has apologised for breaching consumers' trust, and on Friday announced that Matthias Mueller was replacing Martin Winterkorn as chief executive. Mr Mueller promised a "relentless" investigation to uncover what went wrong. He said the group was "facing the severest test in its history." German prosecutors announced on Monday that it was conducting a criminal investigation of Volkswagen's former chief executive.